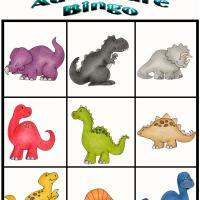 This is the final bingo card from our set of ten dino adventure bingo cards. Print all and your kids will surely love playing this game together and they will surely love the cute dinosaur images in the cards. Do not forget to print the bingo spinner with this theme.